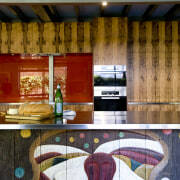 The house and kitchen designed by Jonothan Grose-Jong of Jong Design. 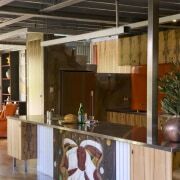 It features sassafras timber cabinets and acid-stained concrete floors. Sustainability is a key driver for the design of many new homes, including this house in a beachside suburb. 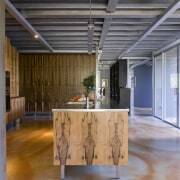 Jonothan Grose-Jong of Jong Design says reducing the carbon footprint was a priority. 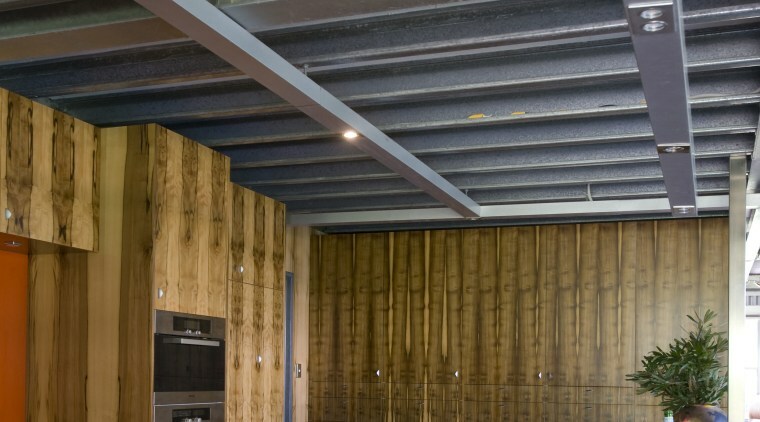 Wherever possible, materials were sourced close to the site, and used in standard 600mm modules to minimise waste and to provide a more cost-effective construction. 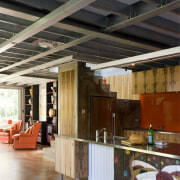 "The house itself has a steel and concrete framework, with very little wood used in the structure," the designer says. "This gives the interior an art gallery quality the owners had seen a gallery built on similar lines." 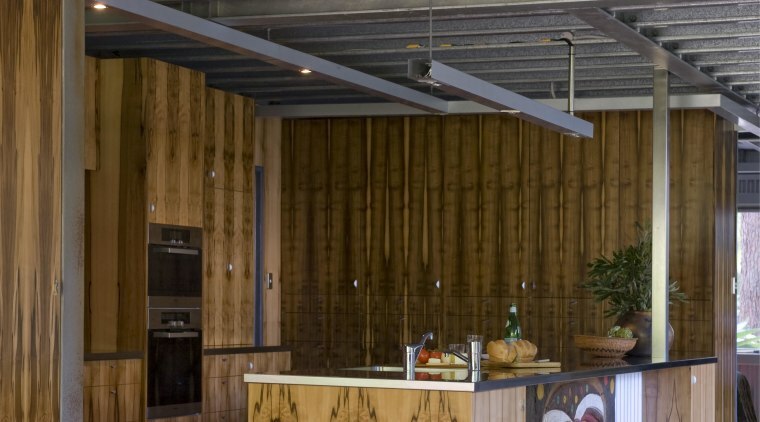 Grose-Jong says the kitchen needed to continue the eco-friendly, semi-industrial look, while also providing a very practical space for the owners, who entertain frequently. 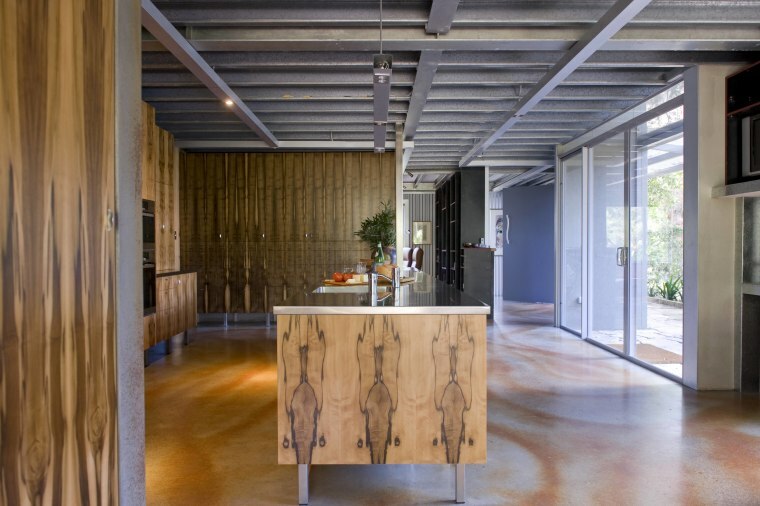 To contrast the home's exposed steel framework and acid-stained concrete floor, Grose-Jong specified sassafras timber kitchen cabinets. 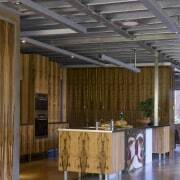 The timber is bookmatched to create a seamless patterning. "We wanted a grain that would stand out," the designer says. "The dark patches in the timber were the areas of dead wood in the original tree." The cabinets are supported by stainless steel legs, and feature stainless steel benchtops, which reinforce the look of a commercial kitchen. 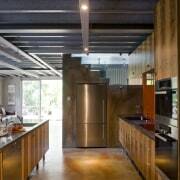 By inserting the kitchen within the exposed steel framework of the house, the cabinets appear to float in the space. 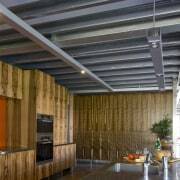 "They become a distinctive feature of the interior," says Grose-Jong. 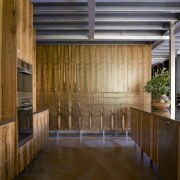 "Similarly, the stairs rising up behind one end of the kitchen help to animate the space as people move up and down." The space is also enlivened by a bright orange glass splashback one of the owners wanted her favourite colour to feature in the kitchen. And the front of the island comprises a sculptural art work by Grose-Jong. Carved from old railway sleepers, the art work, titled Pierrot/Pierrette, was designed originally for a large retail mall that was recently refurbished. Grose-Jong says the kitchen has ample bench space and two sinks, ensuring several people can work in the kitchen at the same time. "There is also a place for everything, so clutter can be kept hidden away."